Michael (Lior Ashkenazi) and Daphna (Sarah Adler) experience gut-wrenching grief when army officials show up at their home to announce the death of their son Jonathan (Yonaton Shiray). Michael becomes increasingly frustrated by overzealous mourning relatives and well-meaning army bureaucrats. While his sedated wife rests, Michael spirals into a whirlwind of anger only to experience one of life's unfathomable twists - a twist that can only be rivalled by the surreal military experiences of his son. The film’s title is named after the dance, where you always end up in the same place no matter what you do in between. 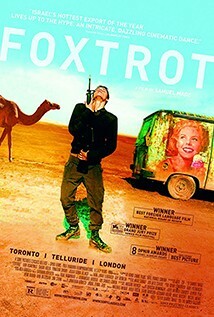 This hugely original black comedy is a thoughtful counterpoint to director Moaz’s 2009 ‘Lebanon’.